Tuesday May 29 2007 marked five years since the international day of United Nations Peacekeepers was designated to pay tribute to the forces around the globe: U.N. Peacekeepers day was established in 2002, when the General Assembly adopted Resolution 57/129 which selected May 29 (the day the first UN Peacekeepers operation was established in 1948). Since 1948, UN Peacekeepers have undertaken 61 field missions, negotiated 172 peaceful settlements that have ended regional conflicts, and enabled people in more than 45 countries to participate in free and fair elections. 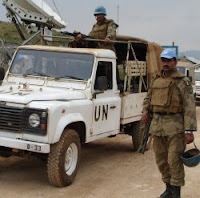 In recent years UN Peacekeeping operations have expanded considerably and there are now approximately 83,000 military and police personnel deployed in 18 UN Peacekeeping operations world wide. Today’s UN Peacekeepers have difficult and often complex missions in some of the world’s most dangerous places: Sudan, Lebanon, the Democratic Republic of Congo (DRC) and Haiti. On Monday, 16. March. 2007, the Khartoum government finally accepted the intervention of the United Nations peacekeeping force to bolster efforts of the beleaguered African Union peacekeeping team, that has struggled to keep calm in the war-torn Darfur region of Sudan. "These paralegals are doing a big job and this has resulted into reduction of the crime rate - we used to have uncountable defilement and domestic violence cases. Their sensitization has done a lot. Except that there are some cases that are beyond their control like people’s erratic behaviour, especially drunkards. 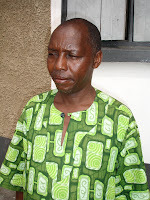 For example, between October and November 2006 in point J, we had a total of eight defilement cases. We took a team of paralegals to sensitise the community against this evil and this did help curb down the crime in this area. 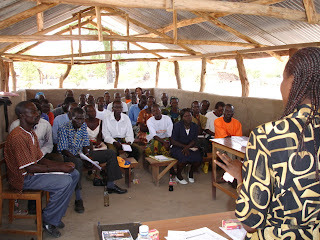 This was in coordination with the Community Facilitators, Office of the Prime Minister and UNHCR officials. Since Sudan Human Rights Association taught us about human rights, people are now much aware of their rights. 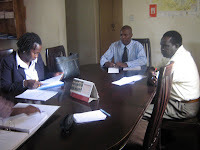 Paralegals have done a lot, the settlement is now calm and we would like them to continue doing such a great job. We would like them to have more skills in handling minor cases and not always involve police in every case. They should practice a lot, because we will not be with them in Sudan. 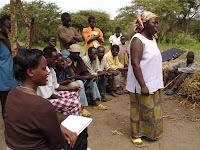 As an officer, I advocate for more trainings and have the paralegals identified to the community." 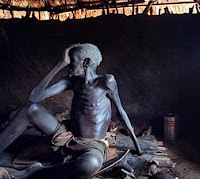 World Food Program (WFP) Uganda is in dire need of additional funding. In order to maintain the food pipeline in Uganda for refugees, IDPs, schools and hospitals, the agency needs $131 millions for 2007. As of today, it has only received around $44 millions. This means that effectively the programme will seize to distribute food by the end of June. The lack of funding seems to follow a general pattern in which donors prefer to allocate resources to IDPs rather than to refugees - and to focus on other areas than Uganda. The shortage is bound to hit all groups of beneficiaries - including Ugandan schools linked to the "Food for Education" program. 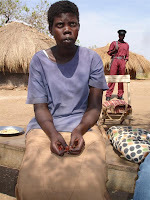 Evidently, this will be difficult to explain to the refugee community; SHRA monitors have already recorded voices in the Sudanese dominated settlements in Northern Uganda claiming that it is in fact a deliberate policy by the Government, UNHCR and WFP aimed at speeding up the voluntary repatriation process by removing the food support. SHRA follows the situation closely. Photo: Soon a thing of the past? 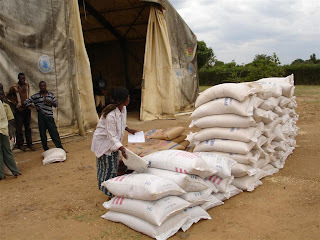 WFP food piles up in Nakivale Settlement, Western Uganda. 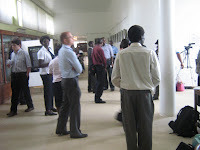 SHRA yesterday sent 2 field officers to Yei, South Sudan. 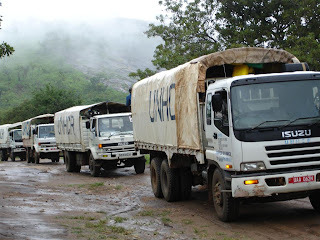 Over the next 5 days they will assess the human rights situation and living conditions of both returned refugees and others in and around the main town of Central Equatorial Province. The assessment focuses primarily on the general security situation, food security and peoples' access to water and sanitation, education and health services. The SHRA team comprises of Programme Co-ordinator Eiyo Margaret and Information Officer Natugasha Maclean. 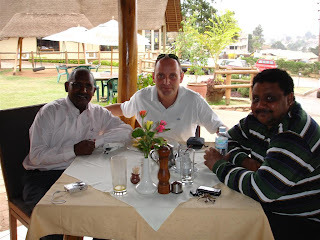 The picture is from a similar mission to Western Uganda last year.